Liquid sensor switch with two gold plated metal probes. 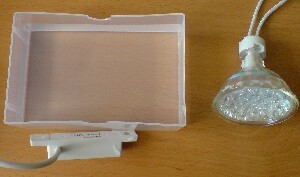 This Liquid Sensor is fitted with two gold-plated probes. When both probes come into contact with liquid (i.e. 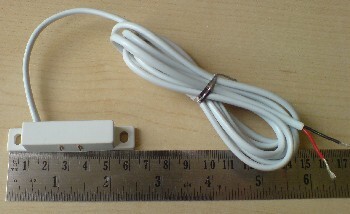 when the sensor is submerged) an internal reed switch closes automatically permitting electricity to flow through the sensor to turn on/off a pump, light, alarm, or relay. * Note that if the sensor is wired the other way around (reverse polarity), the internal switch will be ON whether the sensor is wet or not. This liquid sensor can handle a switching current of up to 0.5 Amps, the maximum switching voltage is 100 VDC, and the maximum switching capacity is 10 Watts. Where the circuit or appliance to be switched on exceeds any of these limits, a suitable relay or transistor should be used. 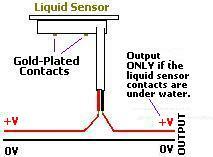 Our Float Switch is an alternative to this liquid sensor.